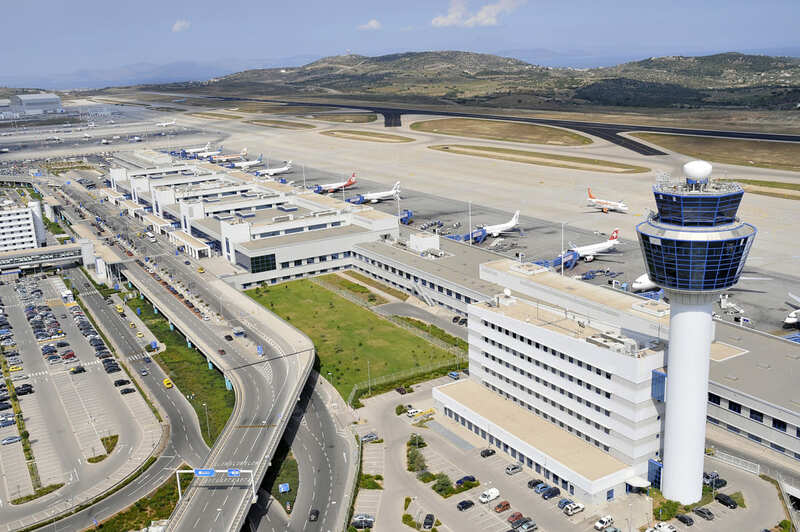 Athens International Airport (AIA), in Greece, has increased the number of passengers by more than 10% in the last year. Approximately 20 million passengers went through its gates in 2016, setting a new traffic record for Athens. These figures involve a significant number of planes landing and taking off. The airport has a strong commitment to environmental protection; it is the first airport in Greece to become carbon neutral. AIA’s commitment to environmental protection goes hand in hand with innovation. That’s why in 2016, the airport partnered with a Greek company specialized in IoT prediction analytics and IoT solutions, Ex Machina in order to explore innovative IoT solutions to enrich AIA’s environmental monitoring, analysis and reporting. Libelium’s technology was utilized for the hardware sensors part of this project. Eight Waspmote Plug & Sense! Smart Cities, three Waspmote Plug & Sense! Environment PRO using GPRS and LoRa communications together with Meshlium IoT gateways using LoRa and 3G communications compose the in field hardware of the solution. The first challenge involved the monitoring and analysis of air pollutant concentrations, such as Ozone (O3) and Particulate Matter (PM1, PM2.5, PM10). Ex Machina focused on the need for an inexpensive, highly portable, stand-alone, connected air pollution monitoring device to complement AIA’s existing air quality monitoring network. The solution is based on Libelium Waspmote Plug & Sense! Sensor Platform, and is comprised of cost-effective, standard hardware assembly with EXM´s custom firmware. Each sensor node is equipped with probes for temperature, humidity, atmospheric pressure, ozone and particulate matter. 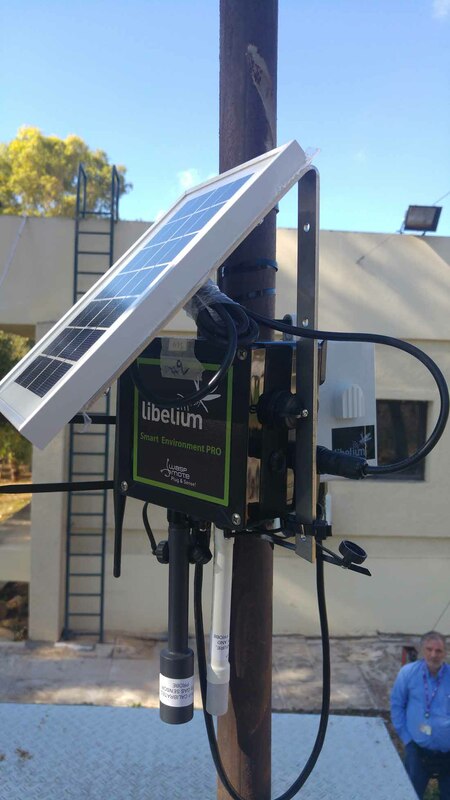 Additionally, throughout the project it was possible to evaluate Libelium’s air quality sensors accuracy, taking advantage of the highly portable/compact and energy autonomous approach of the Waspmote Plug & Sense! model. Finally the LoRa communication characteristics, in terms of range, security and energy consumption were also evaluated. The second challenge was to detect aircraft location in the airfield during take off with a non-intrusive mechanism. To address this challenge, Ex Machina decided to utilize acoustic localization techniques. This unusual, yet innovative approach is possibly world’s first implementation in using noise sensors to determine aircraft location on the airfield. Ex Machina deployed an array of sound/noise metering nodes of Libelium Plug & Sense! 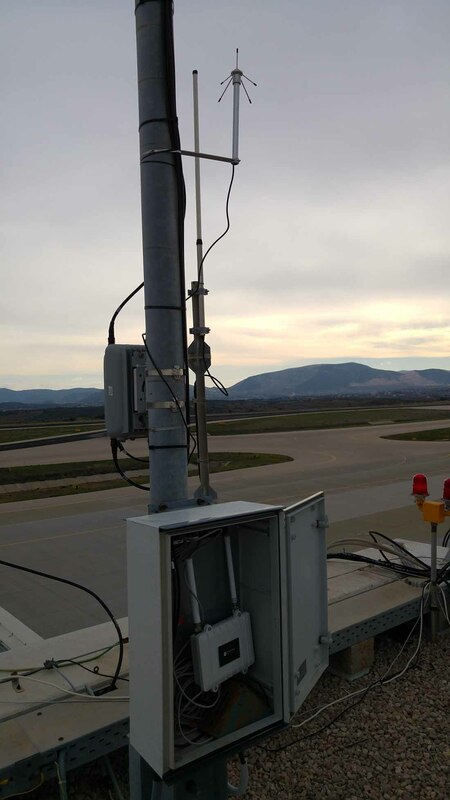 to monitor noise levels on the airfield in real time, thus creating a non-intrusive IoT solution which achieves airplane acoustic localization based on real-time data analytics of the data produced by the noise sensors. Another aspect of the project was the challenges related with the location that the sensors had to be placed, involving multiple restrictions for safety and security reasons. 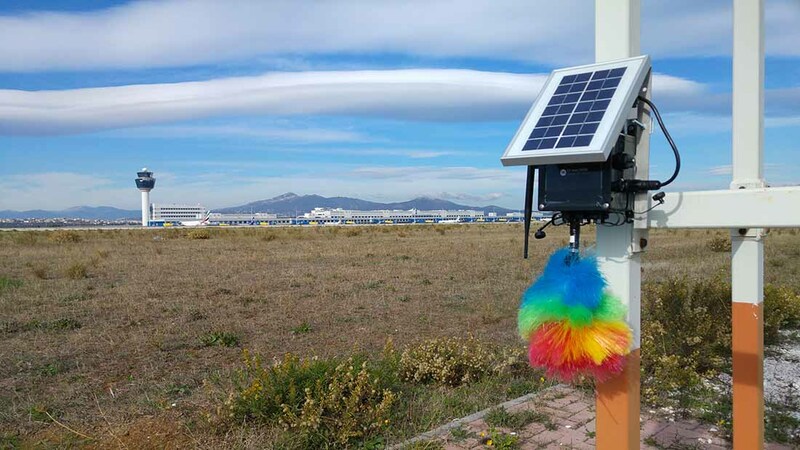 As a result, the sound monitoring nodes were autonomous, bearing solar panels and batteries, and utilized dual wireless communications (GPRS, LoRa). The noise data collected is analysed in the EXM IoT backend, in order to be correlated with various additional information, such as airplane types/flights/airlines. Through the combined analysis of the acquired data, the location of aircraft can be identified and reported to the airport’s environmental department for further statistical analysis, thus enhancing its environmental monitoring capabilities. The EXM turn-key ΙοΤ PaaS combines powerful analytics, visualization and reporting on the data processing cloud side, with on-site sensor deployment and communication infrastructure for real-world data acquisition and aggregation. 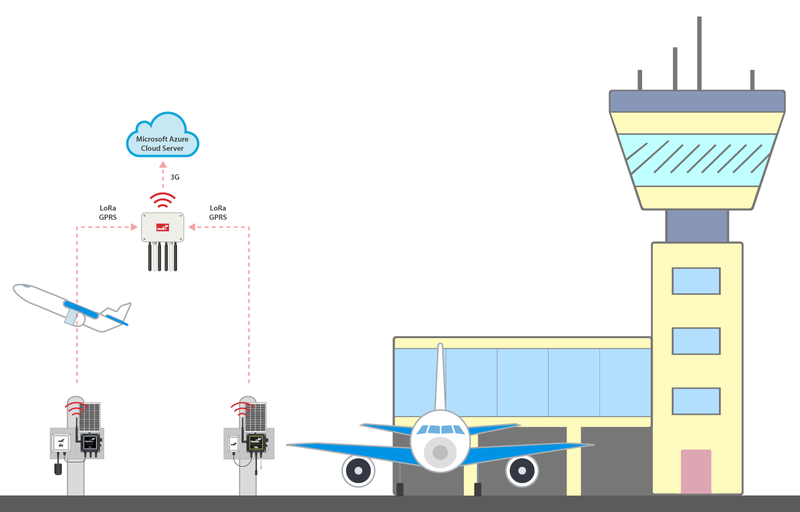 The LoRa communications infrastructure additionally enables the use of diverse low-power wireless sensors and IoT use-cases within the airport site, such as water or gas consumption monitoring, indoor climate/air quality tracking, parking space management, and so on. Ex Machina specializes in environmental IoT predictive analytics offering a wide range of solutions built on top of cutting edge open source IoT technologies and PaaS cloud providers. In the current project, various IoT PaaS options were integrated with Meshlium and were evaluated, such as Microsoft Azure, IBM Bluemix and Sentilo.io which all provided a good fit for the project requirements. Final solution was a mix of Microsoft Azure services combined together with EXM’s components built on open source IoT frameworks/systems including NodeRED, Grafana and InfluxDB. This approach provided the maximum flexibility and extensibility as it was required. Libelium’s Waspmote Plug & Sense! devices send the sensor data using LoRa communications for low power, low range, real time sensor data transmission and device control/orchestration. For secure device management, Over the Air firmware upgrades (FOTA), configuration of firmware parameters and thresholds and the bulk upload of sensor data as backup, the sensor platform uses GPRS communications. Ex Machina’s decision to trust Libelium’s open-source technologies provides maximum flexibility to its end customers avoiding vendor lock-in, being protocol agnostic and at the same time secure, robust and scalable solutions. The use of open technologies to build the solution increases flexibility and transparency, enabling at the same time full access to raw data. Manolis Nikiforakis, CEO of Ex Machina, has a long experience in the field of the IoT. He is the leader of this project, in which an IoT wireless sensor network of thirteen devices made by Libelium has been deployed. 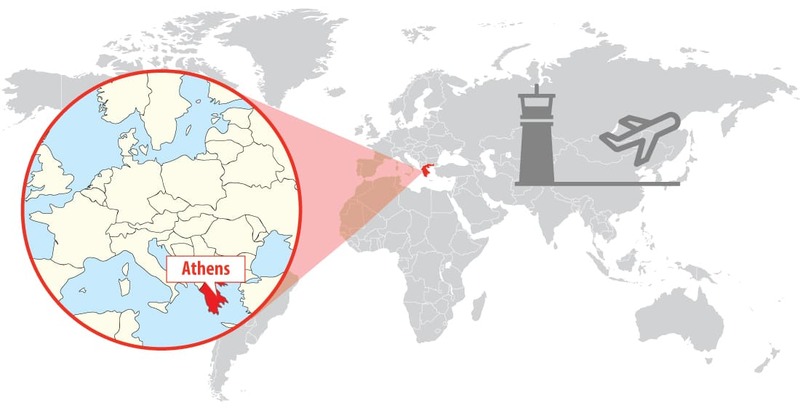 Manolis explains the reasons for the choice of Libelium’s as a partner for this project: “fast time to market with minimum hardware related overhead was an important requirement”, he states. “As this is a pilot project and our focus is on the IoT backend software analytics, we also required flexibility in order to assemble sensor hardware exactly as needed”, Manolis adds. “But equally important is the technical support and Libelium combines both features perfectly”, Manolis states. Airport personnel from the IT and Environmental departments who were involved in the project were satisfied by the project results, both in terms of characteristics of the technology used but also on the analytics results and statistics. Further to this successful pilot, the airport is examining possible use cases with Ex Machina. Overall, Ex Machina, considers the Airport as a smart city as it evolves towards Airport 3.0 thus the deployed IoT /LoRa infraestructure will be extended and reused in various other IoT use-cases. “Libelium provides a very well thought solution addressing the sensor hardware and communication layers of the IoT value chain, making it a perfect fit for R&D projects. In Ex Machina we strongly believe that IoT transformation projects demand an agile approach and Libelium is an excellent first step in this process”, Manolis points out.